For Day 6 I was inspired by the chalkboard look of Amy Kolling’s tags. I even used the Buffalo plaid she showed in her background plate! What took the longest was trying to find a Tim Horton’s gift card to put underneath the smaller tag. I had to settle for a Starbucks card, even though it is Timmy’s you must go to, if you want a donut with your coffee! 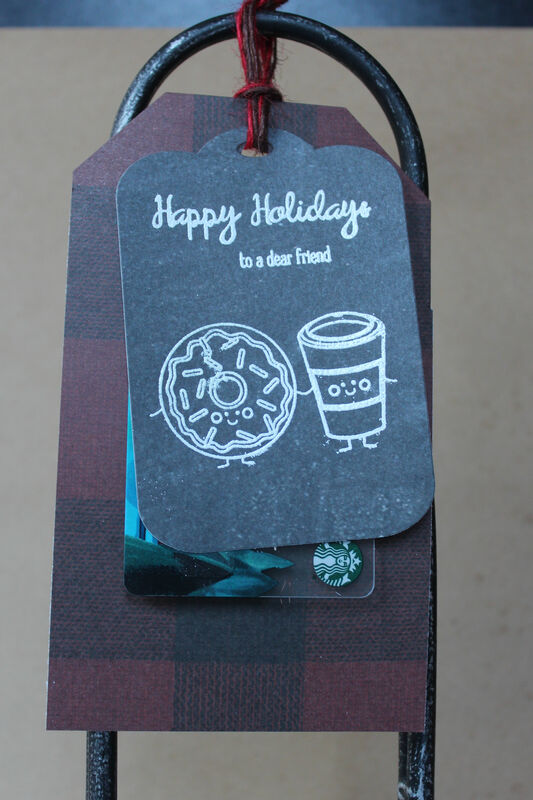 The coffee and donut stamp is from Lil’ Inker who is the sponsor for Day 6. Posted on November 7, 2017, in Card Samples, Challenge Entries, Debbie's Challenge Entries and tagged 25 Days of Christmas Tags, Lil' Inker. Bookmark the permalink. 3 Comments. Two of my favorite things….Christmas and coffee. Great tags. SO fun. Darling tag [mad for the plaid] and what a fabulous gift! Cheers, and thanks for playing Tag [again! and again], Deb!